Multiple choice is a form of assessment in which respondents are asked to select the best possible answer (or answers) out of the choices from a list. The multiple choice format is most frequently used in educational testing, in market research, and in elections– when a person chooses between multiple candidates, parties, or policies. 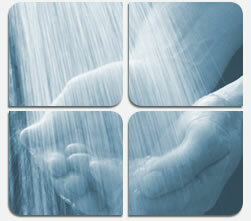 Heres an example of a Health related Interactive quiz created with CC images and Free web tools. It barely took me 10 minutes, and it makes the test so much more interesting. It seems like a good idea to have a number of such narrow interest health inquiry quizzes. This would give us a captive market audience and defined segments by using simple free tools. – What is Public Health ? MCQ quiz -This website was developed by the Association of Schools of Public Health and was made possible by support from Pfizer Public Health. 1. A stroke usually comes on gradually. 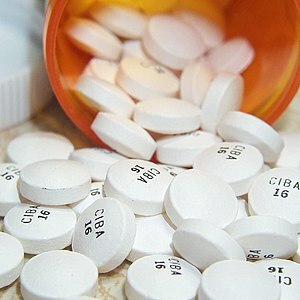 Over-the-counter (OTC) drugs are medicines that may be sold without a prescription, in contrast to prescription drugs. These items can be found on the shelves of grocery/ cosmetic stores and bought like any other packaged product in some countries or in others may be bought “over the counter” from the pharmacy, while prescription drugs are sold at a pharmacy counter. Below is an interactive flash presentation on the subject. It contains the latest public domain data on the potential of OTC markets in India and provides the facts for its bright future. All the references used in this presentation have been enumerated at the end. You can navigate the presentation by quick links, previous/Next buttons or as a simple play video. Here is a simple flash presentation prepared by me discussing the main issues involved in creating an effective health communication media. You can find other such useful presentations and documents also on my Scribd account. 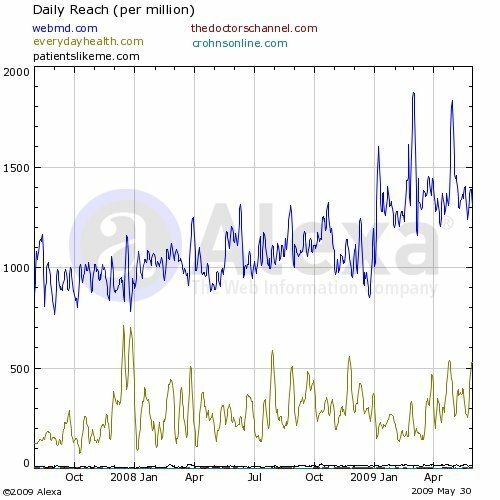 A large number of people are increasing turning to the internet for their information needs. But when it comes to online activity, everyone has a short attention span. Garnering potential audiences for medical content websites, and then retaining them is a big challenge. How do websites and other applications draw and hold consumers for long-form media like podcasts and video-downloads? The Alexa ranking for two years, WebMD beats all other competition hands down, followed by everydayhealth.com. Allothers fare way behind these leaders in daily reach. —short 2 minute animation /user experience videos. Below are quotes by a few top online medical/patient education resources. 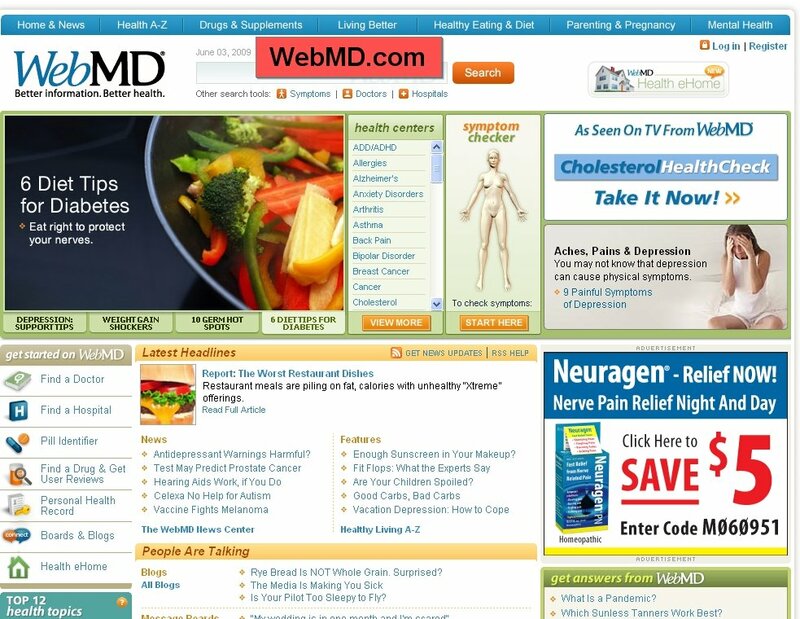 More consumers visit WebMD than any other health site in search of health information. Our editorial and programming teams work closely with our product and technology groups to create the appropriate balance of compelling content together with an engaging user experience. The high level of user engagement on WebMD can be attributed to the high degree of personalization combined with the mix of sight, sound and motion across our network. For example, video is presented as part of the integrated user experience. In the past year alone, we’ve seen an increase in the way consumers are interacting with long-form media. We credit our programming expertise and the fact that many of our visitors are engaged information-seekers who will take time to engage in relevant programming. 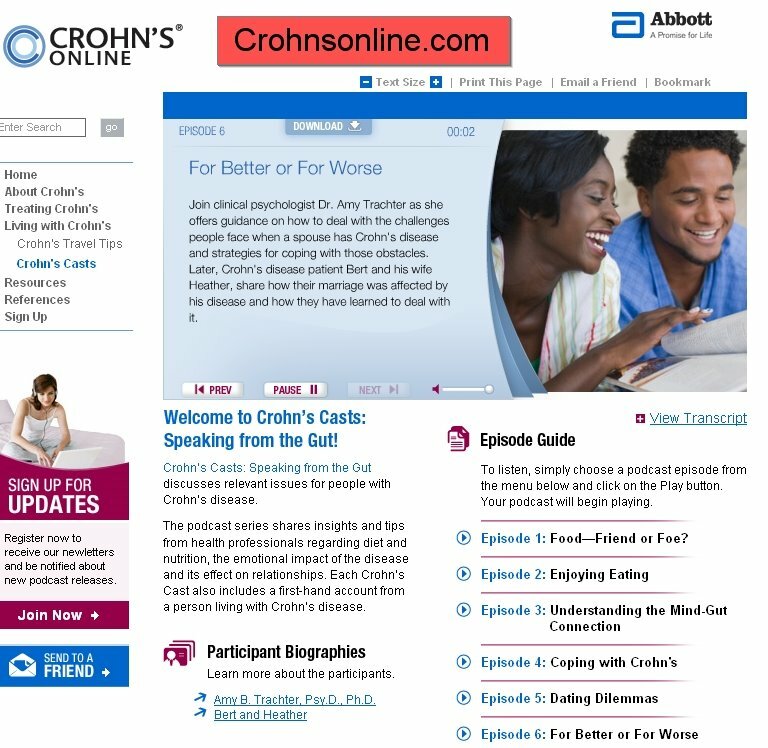 Abbott’s decision to create its “Crohn’s Casts: Speaking from the Gut” series was about addressing the needs of patients by combining the right online tools with relevant topics. Each of the podcasts is under five minutes and shares insights from health professionals regarding diet and nutrition, the emotional impact of the disease and its effect on relationships, and accounts from people living with or impacted by Crohn’s disease. CrohnsOnline.com is a site dedicated to people with Crohn’s disease, a gastrointestinal disease that often strikes between ages 15-35. Since 50% of people with chronic diseases go online to find healthcare information, a podcast was a simple, creative vehicle for this young and web-savvy group. I have found that the best way to draw and hold consumers is to sell them on the idea of shorter content that is packed with more information. The world is media snacking, getting their information in bite-sized bursts. 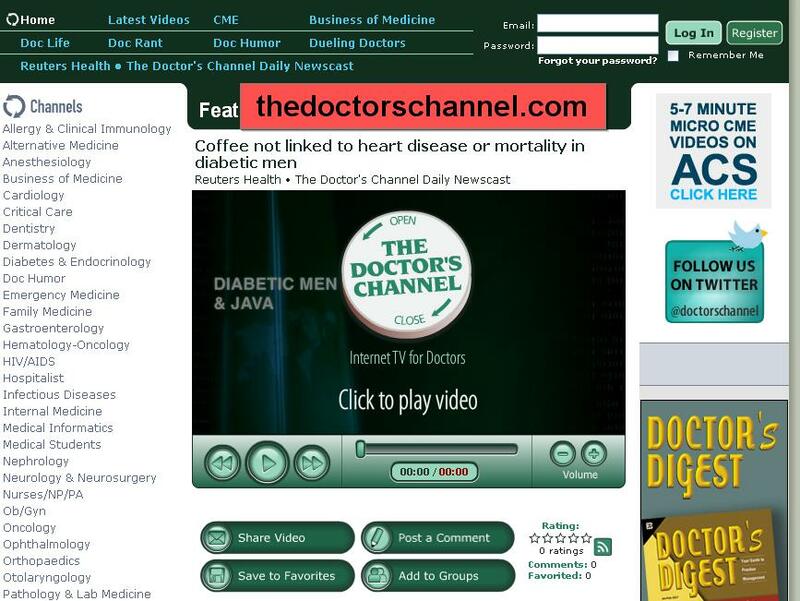 Here at The Doctor’s Channel, we have decided that our best chance to grab the attention of the medical community is not to fight the urge for media snacking, but rather to embrace it. We offer the same content you would find in an 8-minute video, but we provide it in four segments, each 2 minutes long. More often than not, people end up watching all four segments anyway. So consumers end up viewing 8 minutes of content, but because it is presented to them in smaller doses, they are more engaged. But remember, no matter what the “dose,” interesting content is paramount! Online health users have a reputation for being impatient; however, it may be because they’re not finding what they need. Internet users are generally in search of answers to specific questions as opposed to casual browsing. When they find relevant content they stick with it. Audio and video perform best online when they’re specific to a condition and use the visuals and audio to provide important information. For instance, someone in search of content on weight loss surgery is more likely to view animation of the procedure and an interview with a former patient (including visuals of the scar) than watch video of two doctors sitting in a studio talking about it.